Elissa Bishop-Becker's professional journey began with her own grief journey. After experiencing multiple losses, she returned to school and received her M.Ed. (Master of Education) degree from the College of William and Mary in 2000. Along with that piece of paper came a new direction and meaning for her life. Elissa is a Licensed Professional Counselor (LPC), a National Certified Counselor (NCC), a nationally recognized expert in the field of grief and loss, and the co-founder of the Center for Transformative Counseling in Key West, Florida. 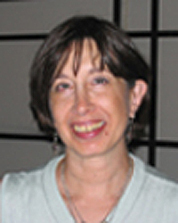 Among her notable accomplishments are being chosen as the Sophia Fahs Lecturer of 2005 by the Liberal Religious Educators Association, working with the Red Cross to counsel hurricane survivors, and teaching a course on her theory of bereavement as an Adjunct Instructor at Florida Keys Community College. Elissa is also a published poet; devoted wife, mother, and grandmother; spiritual seeker; community and political activist; and explorer of all life puts in her path. The only places you're not likely to find her are in the garden or behind an ironing board. What she is most proud of is having guided many grieving clients through the process, helping them find meaning and fulfillment in their new world. What do you like best about writing? When what I know and what I don't know yet come together. In other words, when I begin writing with information I've learned or experienced, and then the ideas flow from there, as effortlessly as channeling. That doesn't always happen, but it always feels right when it does. I don't remember a time when I didn't. But then again, I also wanted to be a ballerina and a princess. Everyone faces grief at one point or another in her or his life. But how to handle it? Here, Elissa Bishop-Becker draws on her own experience to help others with an effective approach known as Transformative Bereavement. Walking the reader through the four stages -- Loss, Return, Reconnection, and Creation -- she draws on stories from her clients, friends, and contacts to explain the process of recovery from grief. Exciting news! 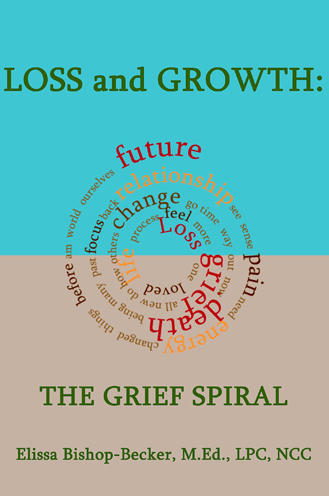 A review of Loss and Growth: The Grief Spiral has been posted on the blog of AIHCP (American Institute of Health Care Professionals). Click to read it here!